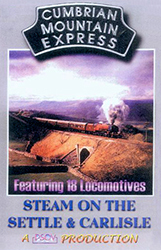 The 72 mile Settle to Carlisle Railway is the most popular mainline steam route in Britain. Here we see 18 mainline steam locomotives running flat out on the fabled grades and viaducts of this moorland countryside. The videography is superb on this remote, mountain line highlighting the moors, viaducts and tunnels. Once almost abandoned, the line has been saved as a great masterpiece of engineering and scenic beauty. Minimal narration. The engines speak for themselves. 90 minutes of solid action in northwestern England. Published in the UK by PSOV Productions and distributed in the USA by Goodheart Productions.